With 14,000 employees worldwide, Sage is one of the world’s largest providers of business applications for small and midsize organizations. In recent years, however, Sage has been struggling to find its way in the cloud, while newer providers, such as Xero, Intacct, FinancialForce, NetSuite, and others have moved aggressively to bring cloud financial systems to the SMB market. As with most traditional vendors, Sage’s approach to the cloud has been largely to offer various types of hosted deployment options. This year, Sage took a bigger step, launching Sage Live, a built-from-scratch accounting system on the Salesforce.com platform. Sage CEO Stephen Kelly and Salesforce CEO Marc Benioff jointly announced Sage Live in a press event in May, 2015. At Dreamforce, the annual Salesforce user conference in San Francisco, we had an opportunity to interview Antoine Henry, VP Product Marketing for Sage Live, about the progress his team has made thus far. As the world’s largest provider of small business systems, Sage has extensive experience in this domain. Pairing up this subject-matter expertise with direct developer support from Salesforce is a powerful combination. Though Sage only began development on Sage Live in January 2015, the product already has an impressive start. General Ledger. The Sage Live ledger provides more than basic debits and credits. It supports multiple companies and multiple currencies. It also can report in multiple dimensions, with no limit on the number. For example, a customer could set up the general ledger to report profit and loss by customer group, product family, project, or any number of other dimensions. Payables and Receivables. There are accounts payable and accounts receivable modules, but they only provide basic capabilities for now. Expect further development of new features over the next year. Payroll is not yet provided but is planned for future versions. Full mobile user interface. Salesforce has been working hard to deliver its platform as one that is mobile first. By building with the latest capabilities of the platform, Sage Live crosses seamlessly between desktop and various mobile devices. Users can not only view data, they can also do any transaction on a mobile device. (We had a first-hand look at this capability. Because Henry was having trouble connecting his iPad to the hotel Wi-Fi, he demonstrated the entire system to us on his iPhone—without a hitch.) For users on the move, being able to do any and all system functions on a smartphone will be attractive. By design, Sage Live will not provide functionality outside of accounting systems. Sage believes this strategy will make Sage Live more attractive for other AppExchange partners. In the latest iteration of the Salesforce platform (dubbed Lightning), users can easily drag and drop functionality from different AppExchange partners into the user’s system. Sage is banking on having Sage Live appear as an attractive option for those customers looking for financial applications. So far, Sage has announced integration with several AppExchange partners, including Xactly (for sales compensation), Docusign (for electronic signatures), and Kimble (for professional services automation). Though Sage Live provides only accounting systems, when it is married up with other AppExchange partners it could become an essential element of a full-blown ERP system. Though Sage does not use the term, we consider such an approach as a “composite ERP system,” created from various components from different cloud providers building on or integrating with the Salesforce platform. The idea of building composite applications appears to be a trend this year in the Salesforce ecosystem. Other AppExchange partners—and even Salesforce itself—have been promoting the idea of having customers assemble their own combination of system components from various partners that interoperate on the same platform. As the story goes, assembling a set of apps is a more flexible approach than buying an integrated suite of modules from a single vendor, as is the traditional approach with ERP. Appropriately, Kelly has banished the term ERP from Sage across all its products. ERP, Kelly says, stands for “Expense, Regret, and Pain.” Though it makes for a great applause line in keynotes, it strikes us more as a marketing ploy than anything intrinsic to Sage’s products. If Sage’s products were ERP systems before Kelly’s diatribe, they remain ERP systems today–no matter what term Kelly uses. Without a doubt, ERP has a poor track record generally in terms of successful outcomes. Research from our sister IT research firm, Computer Economics, shows that of all major technology investments, ERP ranks dead last in economic success. Nevertheless, are ERP problems historically the result of having ERP as an integrated suite from a single vendor? It is not entirely clear how having multiple providers—each focusing on different functional areas of ERP—solves the problem. In fact, the composite approach may have other problems that are not readily apparent. Integration. Will the composite apps really operate seamlessly? For example, will “customer” in one app mean the same thing as in another app? If the composite apps are all sharing the same object—for example, the customer entity in Salesforce—there should be no problem. But what happens when the entity is not a Salesforce object, such as a warehouse or a customer order? Vendor proliferation. When multiple vendors are providing various applications making up ERP, how many agreements will you need to negotiate? And, who do you call when there is a problem? Who serves as the “prime contractor,” and who provides first level product support? Cost. In our ERP and CRM selection consulting, we have already seen cases where Salesforce.com is far from the low-cost provider. This is especially true when multiple AppExchange partners are needed in the deal. If an ERP system is delivered as a set of composite applications from different providers, can it possibly be cost-effective compared to a solution from a single provider? In the case of Sage Live, a higher price point is unsustainable, since other providers such as Quickbooks Online and Xero are aggressive in pricing and have broader feature sets at this point. To be sure, it is a great thing to be able to easily integrate various solutions from different providers. This is certainly the case with niche functionality served up by complementary solutions, such as sales compensation, data collection, sales tax calculation, and the like. Assembling an entire ERP suite like Lego® blocks may not be as easy, however. The market for small business accounting software is tough to penetrate in the US, with Intuit’s QuickBooks the overwhelming leader. But Sage is taking aim, offering a migration tool that allows prospects to upload a copy of their QuickBooks database directly into Sage Live and see a demo of the system with the prospect’s own data. 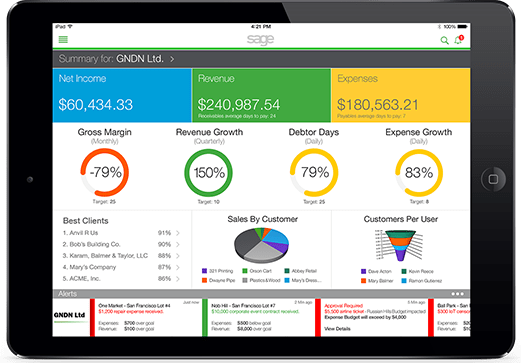 Moving beyond QuickBooks, Sage Live faces additional challenges. Other cloud providers, such as Intacct, FinancialForce, and NetSuite have a head start of many years. In international markets, Xero has gained a strong position and has good momentum. It will not be easy for Sage Live to attack the market broadly. For now, Sage should leverage its relationship with Salesforce to target Salesforce customers that are looking for an accounting system. The most popular solution for this audience right now is FinancialForce. Intacct is also a popular provider, though it is not built natively on the Salesforce platform. With Sage Live entering the scene, Salesforce customers now have another choice. Just as importantly, other AppExchange partners now have another choice when they are looking for a partner for accounting systems. For example, AscentERP currently partners with FinancialForce and Intacct for accounting modules to round out its manufacturing and distribution systems. Sage Live could give AscentERP another option for smaller companies. We would first recommend, therefore, that existing Salesforce customers consider Sage Live when they are looking for a new accounting system. With these customers, the benefits of integration with Salesforce—and potentially with other AppExchange partners—may outweigh the gaps in functionality that prospects are likely to uncover. Prospects that are not running any Salesforce-based products, however, will probably find too many gaps in Sage Live at this early stage of its development. There are three other restrictions that buyers should understand. At this time, Sage Live is only available in the US, though there are beta customers in the UK. In addition, Sage Live is targeting services businesses, which means that, for now, functionality may be lacking for product-based businesses, such as manufacturing, retail, and distribution companies. Finally, larger companies should avoid Sage Live at this time: currently Sage’s target market for this product is organizations with ten to 200 employees. It remains to be seen whether Sage can penetrate Intuit’s strong market position in the US, or whether it can catch up with the established cloud financials providers. By the time it catches up, those providers are likely to have moved farther on down the road. The best bet for Sage Live, therefore, is to target the Salesforce installed base in order to gain a sufficient number of customers as references. It should use them as a test bed to build out its functional footprint. Only then will it be in a position to take on the market more broadly. Sage Live has made good progress with less than one year of development effort. It will be interesting to see the progress that it makes by the next Dreamforce conference. This entry was posted in ERP Selection and tagged AscentERP, Cloud, FinancialForce, Intacct, Intuit, NetSuite, QuickBooks, SaaS, Sage Live, Salesforce.com, Xero. Bookmark the permalink.